It is time to get down to business now that Republicans are flush with victory. You’d think that business would be dismantling Obamacare or moving to outlaw the Federal Reserve. For establishment Republicans and their neocon buddies, however, the first item on the agenda is to make sure the war agenda moves forward. 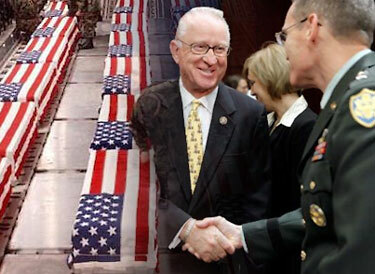 Buck McKeon promised to take the forever war agenda into the 112th Congress. Hours after the Republicans realized their historic victory, U.S. Rep. Howard P. “Buck” McKeon, who is the top Republican on the House Armed Services Committee, wasted little time revealing the “broad vision for national defense policy that emphasizes winning the wars in Afghanistan and Iraq while also investing in the capabilities and force structure necessary to protect the United States from threats of tomorrow,” according to The Santa Clarita Valley Signal. McKeon was elected as Ranking Member of the House Armed Services Committee in 2009 and is looking for the chairmanship of the committee for the 112th Congress. The United States House Committee on Armed Services is responsible for funding and oversight of the Department of Defense and the United States armed forces. McKeon and the neocon Republicans want to sock your kids and grand kids into the misery of eternal debt in order to pay for the invasions of small backwater countries where there are recalcitrant Muslims who have problems with international banksters and world government organizations running every minute detail of their lives. “Our citizens have spoken, and they want a defense budget that is sufficient to address the challenges of today and the threats of tomorrow,” McKeon said. “One percent real growth in the base defense budget over the next five years is a net reduction for modernization efforts which are critical to protecting our nation’s homeland” from dazed and confused underwear and stupendously inept barbeque grill canister non-bombers. Mr. McKeon promised to take the forever war agenda into the 112th Congress, but also said “there is still work to be completed this year,” namely passing a National Defense Authorization Act for Fiscal Year 2011 “that is not weighed down by the current majority’s social agenda items,” or for that matter the demands of millions of Americans who told the Republicans they want fiscal responsibility from the government and a return to the constitutional principles the country was founded upon, including the cherished principle of noninterventionism as spelled out by George Washington. “A return to the traditional U.S. foreign policy of active private engagement but government noninterventionism is the only alternative that can restore our moral and fiscal health,” said Paul. If the attitude of Buck McKeon and the establishment Republicans on the House Armed Services Committee are any indication, it looks like the neocons will rule the roost under Republican control of Congress and it will be business as usual. In addition to the never-ending wars in Afghanistan and Iraq, we can look forward to new manufactured conflicts in Pakistan, Yemen, and elsewhere.